Our boxes are currently available to anyone in Leicestershire, North Warwickshire, Tamworth and most places in between. You can see our full delivery area here. If you are outside of our delivery area and place an order we will refund the order and place you on our waiting list. You can avoid all that and simply add yourself to our waiting list at the bottom of our homepage. Every box you buy reduces waste, helps farmers and donates food to those in need. 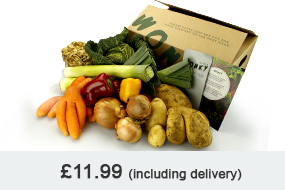 We offer both Weekly and Fortnightly boxes. Choose which box is best suited to your needs and we'll deliver it to your door! 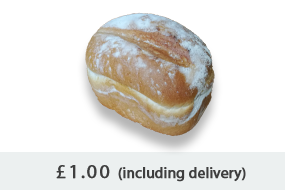 Your delivery day is chosen depending on your postcode. Once you have placed your order we will send you an email within 48 hours confirming your delivery day. 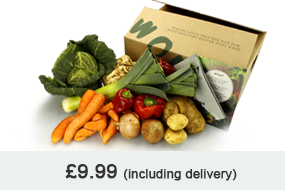 You don't have to be in to receive your veg box, we're happy to leave it in a specified safe place or with a neighbour. 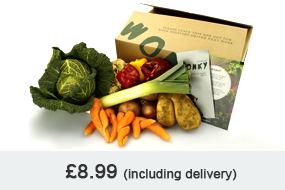 If there are any vegetables that you won't eat we'll happily exclude these from your box for you. Just drop us an email once your order is placed and we'll add a note to your account. We'll include a bit more of everything else instead. This little number should feed 1-2 people for a week. It will be divided between 2-3 staples (potatoes, onions, parsnips, carrots) and 3-5 seasonal items. We always try to maintain as much variety as possible and we will inform you of exactly what will be in your box by email a several days before it arrives. This Goldilocks box aims to feed 2-3 people for a week. It will be divided between 2-3 staples (potatoes, onions, parsnips, carrots) and 3-5 seasonal items. We always try to maintain as much variety as possible and we will inform you of exactly what will be in your box by email a several days before it arrives. Hungry, eh? No problem. This box should feed 3-5 people. It will be divided between 2-3 staples (potatoes, onions, parsnips, carrots) and 3-5 seasonal items. We always try to maintain as much variety as possible and we will inform you of exactly what will be in your box by email a several days before it arrives. This little number should feed 1-2 people for a week. We'll deliver it to you once every two weeks. It will be divided between 2-3 staples (potatoes, onions, parsnips, carrots) and 3-5 seasonal items. We always try to maintain as much variety as possible and we will inform you of exactly what will be in your box by email a several days before it arrives. This should feed 2-3 people for a week. We'll deliver it to you once every two weeks. It will be divided between 2-3 staples (potatoes, onions, parsnips, carrots) and 3-5 seasonal items. We always try to maintain as much variety as possible and we will inform you of exactly what will be in your box by email a several days before it arrives. Hungry? This box should feed 3-5 people. We'll deliver it to you once every two weeks. It will be divided between 2-3 staples (potatoes, onions, parsnips, carrots) and 3-5 seasonal items. We always try to maintain as much variety as possible and we will inform you of exactly what will be in your box by email a several days before it arrives. Let's get fruity! 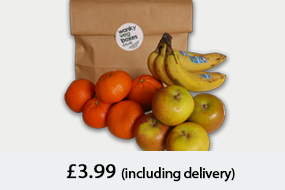 This small bag contains 3 different varieties of fruit and should suit 1-2 people for a week. We will always try to maintain as much variety as possible whilst prioritising fruit that's at risk of going to waste, UK grown and in season. You'll receive an email a few days before you bag arrives letting you know what we have confirmed that week. They're all bit pear shaped! 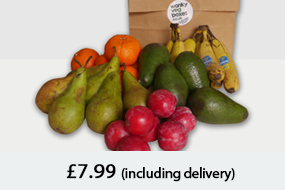 This medium bag contains 4 different varieties of fruit and should suit 2-3 people for a week. We will always try to maintain as much variety as possible whilst prioritising fruit that's at risk of going to waste, UK grown and in season. You'll receive an email a few days before you bag arrives letting you know what we have confirmed that week. This fruit is bananas! The Large bag contains 6 different varieties of fruit and should suit 4-6 people for a week. We will always try to maintain as much variety as possible whilst prioritising fruit that's at risk of going to waste, UK grown and in season. You'll receive an email a few days before your bag arrives letting you know what we have confirmed that week. Let's get fruity! This small bag contains 3 different varieties of fruit and should suit 1-2 people. We will always try to maintain as much variety as possible whilst prioritising fruit that's at risk of going to waste, UK grown and in season. You'll receive an email a few days before your bag arrives letting you know what we have confirmed that week. A bit pear shaped! 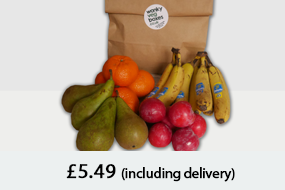 This medium bag contains 4 different varieties of fruit and should suit 2-3 people. We will always try to maintain as much variety as possible whilst prioritising fruit that's at risk of going to waste, UK grown and in season. You'll receive an email a few days before your bag arrives letting you know what we have confirmed that week. This fruit is bananas! The Large bag contains 6 different varieties of fruit and should suit 4-6 people. We will always try to maintain as much variety as possible whilst prioritising fruit that's at risk of going to waste, UK grown and in season. You'll receive an email a few days before your bag arrives letting you know what we have confirmed that week. 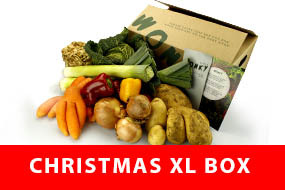 For Christmas we'll be offering an Extra Large Wonky Veg Box for one week only. It will be the size of two large boxes. All our bread is baked fresh that day and delivered to your doorstep. Our bakery sends any waste to a local brewery to be made in to beer so we can enjoy our bread knowing it's waste free! 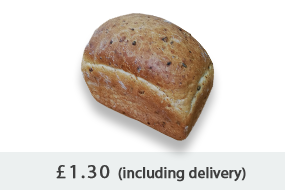 All our bread is baked fresh that day and delivered to your doorstep. Our bakery sends any waste to a local brewery to be made in to beer so we can enjoy our bread knowing it's waste free! We are currently taking preorders. 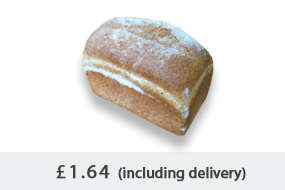 We hope to be delivering bread in the 2nd week of August.